What Are the Uses for Landscape Fabrics? Running down the middle of a space in your side yard is a patch of bare dirt where nothing is currently planted. On the one side is a row of plants, climbing a lattice fence. On the other is chain-link fencing. But the unused area in the middle is becoming weedy. At some point, you are planning on a makeover for this space, which includes planting a flower bed in this area. Meanwhile, you do not want weeds to run rampant, but you do not want to bother pulling them, either. I had just such a situation in my own yard, which inspired the project discussed in the following pages. Organic mulches -- These eventually decompose, a process hastened by contact with the soil. As they decompose, they become fertile ground for weeds. Crushed stone -- An inorganic mulch, crushed stone will not decompose. But stone easily works its way into the soil, which can be inconvenient (you may want to remove it someday). It is also hard to keep clean (leaves blow onto it) and draws considerable heat to the soil, which can be tough on plants. Black plastic -- Like a crushed-stone mulch, it will not decompose; unlike stone, it is easy to clean. But not only does it draw heat (like stone), but it also prevents air, water, and nutrients from penetrating into the soil. These drawbacks will become important once you install plants in this space. The virtue of weed fabrics is that, like black plastic, they serve as clean, durable weed barriers. But unlike black plastic, they permit a certain amount of air, water, and nutrients to penetrate into the soil. Also, a layer of organic mulch applied over landscape fabrics will decompose more slowly than it would if allowed to come into direct contact with the soil. Be aware that weed control is a game in which you can stay ahead, but never "win." Weeds are just too persistent ever to give up. While landscape fabric is supposed to prevent buried weed seeds from ever becoming full-blown weeds, landscape fabric does not, in fact, stop some of the tougher perennial weeds (or grass) from pushing up. If you know you are battling plant pests that grow from rhizomes or stolons, eradicate the rhizomes or stolons first. Then lay landscape fabric, upon confirmation of eradication. In overgrown areas, killing weeds is only one part of an arduous process of "landscaping from scratch." Landscape fabric can be laid after a bed has been planted. If plants were already in place in my planting bed, I would cut slits in my landscape fabric where needed (working from the edge to the middle) as I unroll it over the bed and neatly tuck the flaps around the plants' trunks. Instead (since I am beginning my project on bare ground), I'll be making X-shaped incisions in the fabric where I wish to install the plants (Step #8). The incisions will be just big enough for digging a hole for the root balls of the plants. The fewer and smaller the holes you put in the fabric, the better. Landscape fabric should be installed over ground that has been smoothed out. If laid over twigs, stones, or existing weeds, it could be punctured. I recommend two tools for smoothing out the ground: a hoe and a steel rake. Garden hoes are essentially poles to which a blade has been appended, at a 90-degree angle. The poles (handles) are about 4.5 feet long. These tools are an old-time favorite in the war against weeds. A garden hoe is wielded with a swinging motion. Grip the handle at the end furthest from the blade with one hand. With the other hand, grip the handle somewhere around the middle. Use the garden hoe to slice into the soil around weeds. Raise the garden hoe up, so that the blade is out away from your body (either to your left or right side) and approximately at shoulder-height. Then swing the blade down towards the ground and slightly back towards your body, striking the ground at approximately a 45-degree angle. Ideally, you'll penetrate the soil deep enough to get under the roots and lift out the whole weed, roots and all. Garden hoes can also substitute for steel rakes when you need to level off the soil across a small area. Now that the weeds are uprooted, rake the area with the steel rake. Like the garden hoe, this tool has a handle about 4.5 feet long. As its name ("steel") suggests, its teeth are strong, meant to stand up to rougher treatment than a leaf rake. The objective in raking is not only to remove the majority of the uprooted weeds, but also any sharp objects that could damage the landscape fabric -- twigs, stones, etc. Steel rakes are also used to even out garden soil. To use a steel rake, pull it across the soil using a motion similar to that for a leaf rake, but also push it as you would a push broom. Push and pull, push and pull, back and forth, removing extraneous objects with your hands -- until the planting bed is smooth. 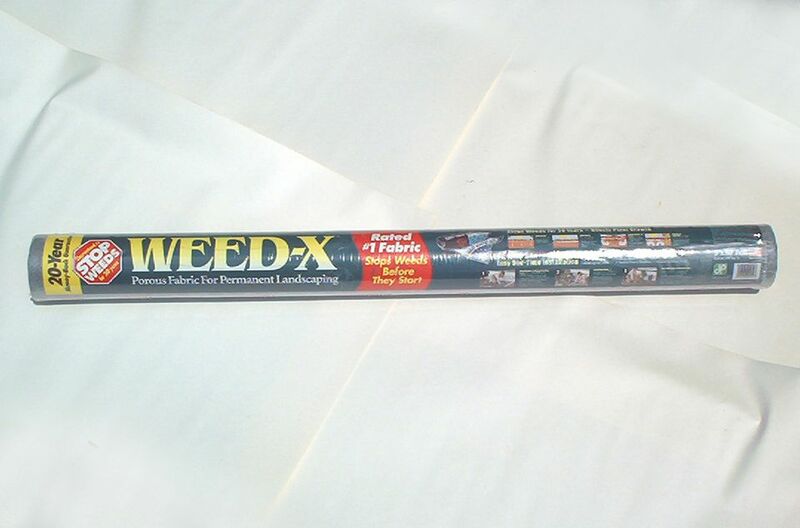 I chose to work with the "Weed-X" brand of landscape fabric, as shown in the picture on Page 1, because its tight weave forms an imposing barrier against weeds. "Cover WEED-X completely with a 2-inch layer of pine needles, wood chips or shredded bark to protect it from sun. If a stone covering is used, use only a thin layer of small, smooth pebbles." These instructions aren't arbitrary. Resist the temptation to think, "If some mulch is good, more is better." As mentioned earlier, organic mulches such as bark will eventually decompose. Therefore, if a deep layer is applied, you're just inviting weed seeds to germinate and strike down deep roots. Such roots will eventually compromise the integrity of the landscape fabric. Weed seeds can germinate even in stone mulches. As organic matter (such as leaves, as in the picture here) blows over the stones and breaks down, it leaches through the spaces between the stones. Eventually, it decomposes to the point of becoming dirt, and weed seeds that come into contact with it will germinate in it. The deeper the layer of stones, the more organic matter that will get trapped within. In the area where I'm installing landscape fabric, the width is great enough that I need two sheets for complete coverage. When using two or more lengths of weed fabric adjacent to each other, be sure to overlap. Overlapping sheets of landscape fabric blocks weeds so they don't poke up through the seams. The instructions on the "Weed-X" wrapping say to use a 3-inch overlap, but I recommend being on the safe side and overlapping by at least 6 inches. 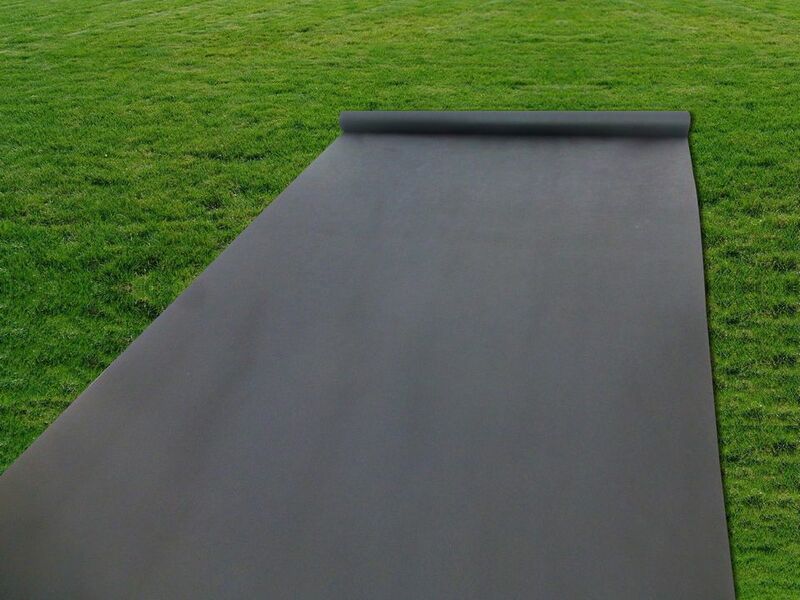 Install landscape fabric with the black, shiny side facing up. If it's windy outside when you're installing landscape fabric, weigh it down with anything heavy you can find so that it won't blow. Landscape fabric pins, or "garden staples" can be inserted through the weed barrier to pin it down. The pins are usually sold separately from the fabric. No need to go crazy with the landscape fabric pins; remember, the mulch will help hold the landscape fabric down, too. A landscape pin every ten feet along the exposed edges (and along seams, where you have overlap) should be sufficient. Now that the landscape fabric is secured, apply your mulch on top of it. Using the steel rake, spread it out evenly. Okay, you've successfully installed a weed barrier in your planting bed and applied the mulch on top. But with the landscape fabric and mulch in the way, what do you do when it is planting time? Keep the incisions as small as possible. Make slits in the landscape fabric, rather than cutting out and removing portions of landscape fabric. Ready for planting? The area in question is, after all, a planting bed, despite the emphasis so far on weed control. But you will be glad later on that you spent so much effort on weed control at the outset of the project. There is an old saying that seems particularly relevant here: an ounce of prevention is worth a pound of cure. Having made an X-shaped incision (see prior page), resulting in the formation of four flaps, I can simply lift and separate these flaps in order to access the soil for excavation. I recommend having a wheelbarrow or other container nearby so that you do not have to shovel the excavated soil onto the landscape fabric. The less soil you get on the landscape fabric, the better, to minimize the potential for weed-seed germination later. After the hole has been dug, install the plant. Fill the excavated soil back in around the plant, tamping down to reduce air pockets. When you are done planting, the four flaps of cut landscape fabric are positioned tightly against the base of the plant. You are not left with any significant gap in the landscape fabric for weeds to exploit. The photo on this page shows the completed project -- for the purpose of the present article, that is. I do, however, intend to install more plants in this space at a later time. To do so, I will repeat the process described in Steps #8 and #9. The salient point of the project as described here is that, in the meantime, weeds will be kept in check. As the garden mulch decomposes over the years, I will have to remove it, applying a new layer to take its place. At the same time, I may well replace the landscape fabric, as well, before too many plant roots become entangled in it. "How to Start a Garden"